An investors document produced by Hyundai Securities Research to initiate the coverage of Silicon Works (a supplier of key components for Apple products) reveals the firm expects smartphone shipments to grow 20% YoY on average despite the global economic slump. These figures are outpaced by the forecasts of the Tablet PC sector, where a growth of 39% YoY on average is expected til, at least, 2016. Hyundai Securities also expects Apple to hold its monopolistic lead in the tablet market until 2013, when they will face a fierce competition from Android, Windows 8 and Windows RT. 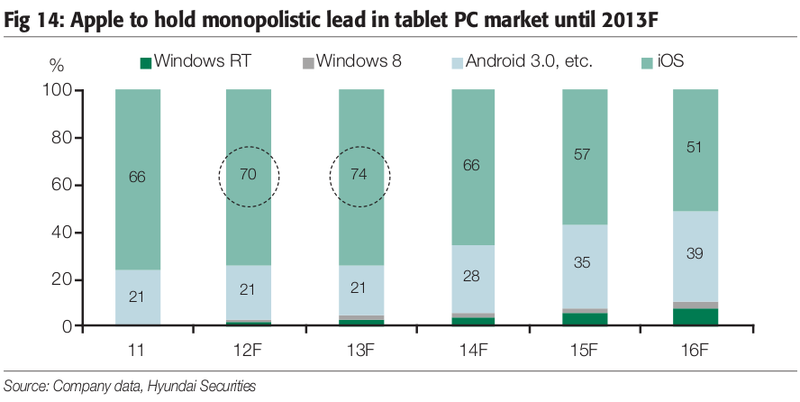 Surprisingly, Windows RT is expected to surpass Windows 8 slates in these graphs. The report also has other pearls, such as the approximate release dates for the iPad Mini, iPad 3 and even the iPad Mini 2 (Figure 13). Of course, everything in there should be taken with a pinch of salt, as financials used to be based on expectations and trends (facts are things of the past) but the document is an interesting read nonetheless. Do have a look while it's hot.